Albert Collins and Johnny Copeland were longtime associates, going back to the days when Collins took a teenaged Copeland under his wing and taught him a few licks on his guitar. Many years later, a young teenager in Tacoma, Robert Cray, was blown away by the musical act at his high school graduation dance, who was none other than Albert Collins. As he had done with Copeland years before, Collins took young Cray under his wing and taught him some nasty Texas Blues guitar. By the mid '80s, Collins was one of the most visible bluesmen this side of B. B. King, having recorded five scorching albums for Alligator (including THE Albert Collins album, Ice Pickin’) and appeared at Live Aid. At the same time, Copeland had recorded four powerful albums for Rounder, including the essentials Copeland Special and Texas Twister (which featured Stevie Ray Vaughan on a couple of tracks). During this time, Alligator Records, Collins’ label, decided to team up Collins and Copeland, along with Gatemouth Brown on an album. When Brown was unable to join them due to scheduling conflicts, Cray was brought in. During this same time, Robert Cray had nearly equaled both Collins’ and Copeland’s fame, coming off two impressive releases on the Hightone label, Bad Influence and False Accusations. The final product of the union was Showdown! To put it simply, this is as perfect a blues album as there is. 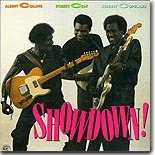 The vocals and guitar solos are split evenly, with Collins appearing on all nine tracks, sharing four with Copeland, three with Cray, and appearing with both on the opening track, a splendid cover of “T-Bone Shuffle” and the closer, Ray Charles’ “Blackjack,” which features some outstanding solo fretwork by all three. Cray’s contributions are a bit more restrained, including a nifty cover of Muddy Waters’ “She’s Into Something,” but his fervent vocal on “The Dream” is chill bump-inducing. As for Collins, for the most part he serves as the master of ceremonies, allowing the other two to have their moments. But when it’s his turn to take the guitar spotlight, he shows why he was known as The Master of the Telecaster, infusing each song with the icy tone that made his sound so instantly recognizable (witness the outstanding Collins/Copeland instrumental “Albert’s Alley”). While his vocals are not as strong as Copeland’s or Cray’s, they are a nice fit with the songs he does. The band supporting these three are a veritable Who’s Who in Chicago Blues, with Allen Batts on organ, Johnny B. Gayden on bass, and the great Casey Jones on drums. Collins would later move to the Virgin/Pointblank label and record several other fine albums, but none as great as this one, before dying in November of 1993 after a battle with lung cancer. Copeland recorded several albums for Verve and survived a heart transplant, before dying in 1997 from complications from additional heart surgery. Cray is largely credited for helping to trigger the resurgence of interest in the blues. He’s recorded numerous albums of his Stax/Hi Records soul variation of the blues, with varying success, including 1986’s Strong Persuader, which is considered by many to be his masterpiece. If you’ve read this far, you probably already own Showdown! If you don’t own it yet, your blues collection is incomplete.